House. Small C17 timber framed house, refronted and extended mid-late C18, with long C18-C19 range of former outbuildings to rear. Vitreous brick in header bond with red brick plinth, quoins and window surrounds. Moulded brick eaves. Old tile roof, flanking brick stacks, that to right with C17 thin brick. 2 storeys and attic, 3 bays. Ground floor windows altered to 4-pane sashes with gauged brick heads, originally narrower. First floor has 3-pane sashes with moulded frames. Gabled dormers with paired wooden casements. Central 4-panelled door in wooden surround of moulded pilasters and flat cornice hood on cut scroll brackets. Rear range has re-used C18 windows. Robert Shelton of Winslow Cordwainer, eldest son and heir of Robert Shelton, admitted to a messuage in Cowstreet in the possession of Joseph Ayres, Taylor (near his brother Richard Shelton's), which came into the lord's hands on the death of his father presented at the last general court on 27-28 Oct 1746. Robert Shelton and Ann Shelton, widow of Robert deceased, then surrendered the messuage to the use of Benjamin Ingram of Winslow, Chapman. It could be the messuage in Cow Street which Robert Shelton sr inherited from his brother Richard in 1742. He left most of his property, including the Sow and Pigs, to his son Benjamin Ingram. His daughter Sarah Eagles, who evidently lived with him, received " my stock of Liquors of all sorts". His son Richard Ingram, who evidently took over the running of the inn, inherited some other property instead. 1813: Sow and Pigs offered for sale with the other property of Benjamin Ingram. Benjamin Ingram, formerly of Husbands Bosworth but late of Wigston, grazier, deceased, held under the will of Benjamin Ingram 1785, the messuage or tenement known by the name or sign of the Sow & Pigs now in the occupation of William Ingram, and various pieces of land. He died intestate. His eldest son and heir Benjamin Ingram of Wigston, an infant, was granted admission through Thomas Cave of Husbands Bosworth, appointed guardian by the court. A PUBLIC HOUSE, called or known by the Sign of the SOW AND PIGS INN, with convenient out Buildings, situate at WINSLOW, in the County of Buckingham; and also 13 Acres of capital grass Land, or a less Quantity, if required, in the Occupation of William Ingram. For further Particulars, and to treat for the same, apply to LAUNCELOT WYATT, Esq. Winslow, or to Mr. THOMAS CAVE, Husband’s Bosworth, Leicestershire. 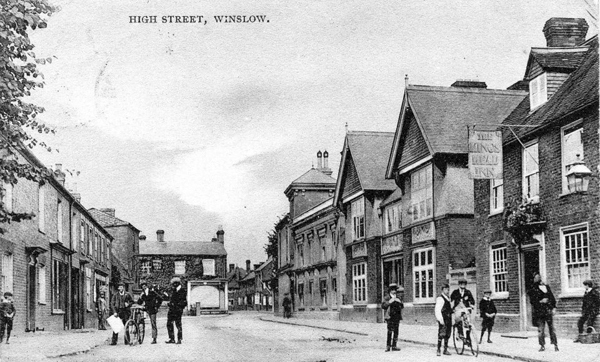 ALL that COPYHOLD MESSUAGE or TENEMENT, with Yard, Stables, and other out-Buildings, in good Repair, conveniently situated in the Town of WINSLOW, known by the Sign of the SOW AND PIGS; with about 70 Acres of capital grazing and arable land, in the Occupations of George Hawley and Robert Judkin. For a View of the Premises, apply to the TENANTS; and for further Particulars, apply to Mr. THOS. CAVE, Husband’s Besworth, Leicestershire; to Mr. ISAAC LOVELL, or Mr. DECIMUS COOKE, Solicitor, both of Leicester. The public House and 12 Acres of Land will be lett from Lady Day, if not sold. An old-established public house known by the sign of the Sow and Pigs ... with brewhouse, stables ... now in the occupation of Mr Francis Viccars. 1820: Advertised for sale by Mr Phillips of New Bond Street. All that messuage or tenement situate standing and being in Winslow aforesaid and held of the said manor heretofore in the occupation of William Mobbs afterwards of Thomas Cranwell and now of George Cross or his undertenant called or known by the name of the Sow and Pigs. CHARGE AGAINST A BAKER. – George King, baker, Winslow, was charged with selling bread light in weight. – He pleaded not guilty. – Annie French, Winslow, said on October the 30th Mrs. Wilson asked her to get two half-quartern loaves from King’s. Witness went, and saw Mrs. Dodwell, whom she asked for two half-quartern loaves. Mrs. Dodwell gave witness some bread, for which she paid 4½d, and gave it to Mrs. Wilson. The latter took one loaf in to Mr. Bailey, the grocer’s, and witness saw it weighed, when it proved to be only 1 lb. 8ozs. Mrs. Wilson then handed the loaf over to P.S. Knight. – Cross-examined : Witness took the loaf to Walker’s, down the lane. Mrs. Wilson was there keeping house whilst her sister went to a funeral. Witness asked Mrs. Dodwell for a plain loaf but she had not one, so witness had a cottage. Mrs. Dodwell said that was all the bread they had in the window. Witness did not know whose bread it was. – Mrs. Rose Wilson said she sent the last witness to defendant for two half-quartern loaves, and gave her 4½d. to pay for them. She bought two loaves, and witness said one was not a half-quartern. After the witness took the loaf to Mr. Bailey’s, and had it weighed, when it was found to be 7½ ozs. short. Witness afterwards handed it over to P.S. Knight. Next morning Mrs. Dodwell’s little girl came and brought ½[?]d. saying they were sorry. Witness did not take the money, because she had taken the loaf to the police station. – Cross-examined : Witness was quite satisfied with one loaf, but knew the other was short. She was quite sure the loaf produced was the same. Witness did not send her sister to defendant to settle the matter. – P.S Knight said the two women brought the loaf to him, and from what they said he took it to the stores and had it weighed, with the result stated. The weights at the stores had been verified the previous Thursday by the County Inspector. The same evening defendant came to witness and said he did not want the matter to go any further, as it would do him harm. Witness told him he had reported the matter to his Superintendent, and defendant then said he would County Court Mrs. Wilson’s two sisters, and make them pay the fine. – Defendant said he was away from home delivering bread, and finding he was running short he went in home for the loaves he had left. On asking Mrs. Dodwell he found she had sold them both, and he told her one was a 1½d. loaf. He then tried half-a-dozen places in the town to get a loaf, but could not. He really knew nothing about it, or whether the loaf was his or not. – Mrs. Mary Dodwell said she was living at the King’s Head Inn on the 30th October. She served Mrs. Wilson’s girl with two loaves, and took 4½d.for them. She occasionally served bread for Mr. King when he was out. She had no other bread beside his. The girl asked for two loaves, but did not say half-quarterns, and witness gave her the two out of the window. Witness was busy packing up, and when the girl brought them back she told her it was no use bothering her; she must wait till Mr. King came home. When he came he said one loaf was a 1½d. one, and asked witness who had it. It was quite a mistake on witness’s part, who only sold them to oblige Mr. King, and had no interest whatever in the matter. – Mr. Dodwell, husband of the last witness, asked to be allowed to say that Mr. King usually told Mrs. Dodwell what the price of the bread was, but he forgot to do so that day. – The Bench said defendant was very remiss in putting bread in his window that was not proper weight, but as they quite believed Mrs. Dodwell sold it in mistake the case would be dismissed. BROOKS James, of Winslow, co. Buckingham, victualler and cattle dealer; sur. 14th Mar. half-past twelve, 18th April, half-past eleven pr. Court – Basinghall-st. Com. – Evans. Off. assig. – Johnson. Sols – Munday, Carey-st, Lincoln's-inn; D.T. Willis, Winslow. Pet. dated Feb. 28. Pet. Cr – George Mayne, Winslow, maltster. RE BROOKS, OF WINSLOW – The bankrupt, Jas. Brooks, an innkeeper at Winslow, Bucks, came up and applied for his certificate. Mr. Munday appeared for the trade assignee, Mr. Geo. Mayne, Buckingham, maltster; and Mr. Lawrence supported the bankrupt. The creditors' debts amount to 1052l. 0s. 10d., to meet which the bankrupt gave up property valued at 123l. 10s., and debts, 16l. 6s. 3d; but the actual assets received by the official assignee are 66l. 4s. 9d. No opposition was offered, and the bankrupt obtained a certificate of the second class. Sale of 2 quarter brew plant, 120 and 24 gallon coppers, William Mortimer leaving on expiry of the lease, having been there in 1854. William Mortimer was still in Winslow in 1861, listed as a builder, a widower living on his own at what is now 160 High Street. He sold up in 1862. He had remarried and moved to Farnborough by 1881. George Mayne, of Winslow, maltster, v. James Payne, of Wing, farmer. Mr. Small for plaintiff, and Mr. D. P. King for defendant. The action was brought to recover £34 6s. damages sustained by plaintiff in consequence of the neglect of defendant to observe and perform certain covenants in a lease of a public house at Winslow, for the due repair of such premises. Mr. Willis, of Winslow, produced the lease, which was made between George Mayne of the first part, and William Mortimer and James Payne of the other part. The premises known as the King’s Head were leased to Mortimer who covenanted to repair the same, and leave them in a tenantable state of repair; the present defendant Payne joined in the lease as a security for the due fulfilment of the covenants on the same not being observed and performed by the same Mortimer. 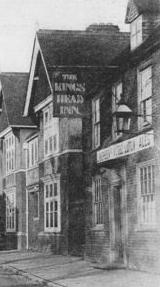 George Mayne on being examined said in 1850 he leased the King’s Head to Mortimer, when he entered the premises and occupied them till Lady-day, 1860. In 1859 engaged Mr. Sheppard, of Newport Pagnell, to go over the premises and report as to their state. He made a report and a copy of it was sent to Mortimer; the repairs were not done when Mortimer left the house; had since requested Mr. Sheppard to go over the premises again; he did so a few week ago and found a few repairs had been done. Cross-examined by Mr. King: the last survey was made this month; was not aware that Mr. Green had made a valuation; believes it was some time in April, and the amount certified by him was £22 13s. ; did not pay much attention to it; saw Mr. James King about these repairs on 23rd April; at that interview offered £7 10s. in order to get the repairs done immediately, but if not done did not mean to give it; Mr. Mortimer was not present when this offer was made to Mr. King; made no alterations in the buildings, and the other tenant came in before Mortimer left; the first valuation was made four months before the term expired, and the second three-quarters of a year after that date: - re-examined: Mr. Green made no valuation about the malting except in the drying loft; the premises had nothing done to them in the inside; some tiles had been removed; had been all over the premises and saw there was a great deal to be done. Mr. Sheppard said, on going over the King’s Head premises, he found a considerable amount of repairs was needed to make them tenantable; saw the lease and read the covenant applying to defendant; the costs of the repairs on first valution [sic] would have been between £40 and £50 was requested to examine same a second time, and found some small repairs here and there had been done; made a further valuation comparing it with the first, and stated what remained to be done; the last valuation was £34 6s. ; there was no perceptible difference in the amount of repairs required at both those times, except when repairs had been done; very little had been done to the malting; it required about £14 or £15 repairs; painting and papering had been partly done, but still something remained to be done. Cross-examined: - Could hardly undertake so much want of repair that had arisen in ten years time, but much of it arose from neglect; a trifling amount of window glazing, &c., had been done; some repairing had been newly done amounting to perhaps £30; damage to scarcely any amount had been done since the expiration of Mortimer’s tenancy. Mr. Ingram said, he was a carpenter at Winslow, and knew the premises in question quite well; had been through Green’s valuation; valued the repairs done at £10, and the repairs to be done at about £30. Mr. King contended in defence that repairs had been done by Mortimer according to Green’s valuation, but as he (Mr. King) had only been instructed in the case that morning, and had not been able to procure Mr. Green’s attendance he must ask for an adjournment of the case. On this Mr. Small applied for costs, when some discussion took place, and ultimately it was agreed that the defendant should pay £25 in full of all claims, and a judgment for that was thereupon enetered [sic]. TO BE LET, that well-known and commodious INN, doing a good Business, knowcn as the KING’s HEAD, WINSLOW, with good Stabling and convenient Premises. Rent moderate, with possession at Lady-day. There is a large Bakehouse attached to the Inn. Applications should be made to Messrs. TERRY and SON, Walton, Aylesbury. Frederick Roads, now farmer and builder, had moved to Buckingham Road by 1891. Holdovers were granted of the "King's Head," Winslow, to Jabez Price, and of the "Rose and Crown," to Helen Hatwell. Messrs. F. Higgins and Co. applied for an ejectment order against Jabez Price from the "King's Head," Winslow. Evidence was given by an employee of Messrs. Higgens [sic] and Co., and by Mr. W.N. Midgley. An order was given for a warrant, to issue after the lapse of 21 days. This Edward Lines appears to have been no relation to the Edward Lines who kept the Black Horse at the same time. The King's Head seems to have closed by the time of the 1924 directory. It became a house for the well-to-do, although Parkers' antique shop later occupied the empty space behind the gateway to the left.